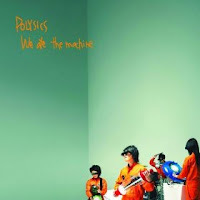 So yea, verily last week @tibieryo obliterated us all with the mighty power of Polysics "We Ate The Machine", which certainly shook all of us out of our Sunday reveries, and provoked one of the best comment piles so far. Many thanks to him for the pick! "I’ve managed to absolutely decide what’s definitely going to be my Listening Club choice quite a few times this week. I had this one thing lined up and it’s great, and I can say, yeah, it comes from this point in my life when this happened, but then I auditioned it on the way into work and it didn’t feel quite right. A bit four in the morning and peters out at the end. Love it, but still. Then I came up with something else that ties to another point in my life, but then I realised that’s not a story I especially want to tell, so that got shelved too. I briefly toyed with the idea of deliberately choosing a well-known or at least important album that I’ve come to embarrassingly late (there are quite a few of those) and seeing who knew it, who didn’t, and what people had to say about it. I still quite like that idea, but it can wait. And then there was this other thing that was my favourite album of a few years back, but it was slightly too long and impossible to cut and maybe just a shade too hippy-drippy. So there you have it... Download link is here (direct dropbox link), and Mixcloud is here for all you streamers.